This month Alli from Made with Happy has put together a series of Kid's Crafts from Around the World. When she asked for people who wanted to participate I was really excited to sign up. First of all I thought it sounded like a really fun idea. I have always enjoyed learning about different countries and cultures and I think kid's crafts are a fun way to do that. In fact, a couple of years ago I spent a summer doing "Mom School" with my kids using an around the world type theme. We did some fun projects based on the different countries we were learning about. We made little passports, learned about the different flags, did little craft projects and cooked food from different places. It was a lot of fun. This kind of reminded me of that. The other reason why I was really excited was because I knew exactly what country I wanted to do. 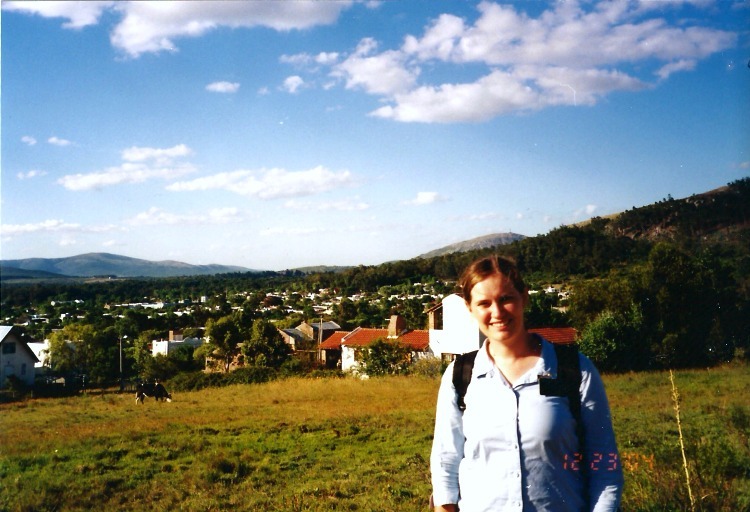 About 12 years ago I left home to spend a year and a half serving a mission for the LDS church in Uruguay. It was an amazing experience and I am so grateful to have had that opportunity. When I found out I was going to Uruguay I think that the only thing that I really knew about it was that it was in South America and I would be speaking Spanish. During the time that I spent there I grew to love the country, the people, and the culture. 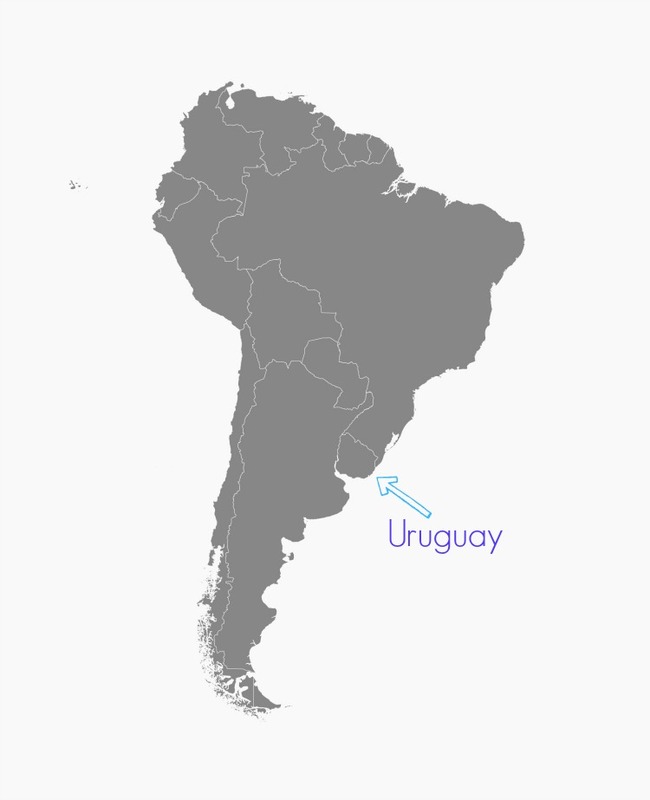 Uruguay is located on the east coast of South America, between Brazil and Argentina. It is not a very big country and most of the people there live in the capital, Montevideo. The rest of the country is pretty rural and has a lot of green, grassy, open space. As a result it is probably not surprising to find out that they raise a lot of cattle and sheep. Beef is one of their main exports and they make a lot of things with leather and wool. As I was trying to think of something that I could make that would be representative of Uruguay they first things that came to mind were leather and wool. 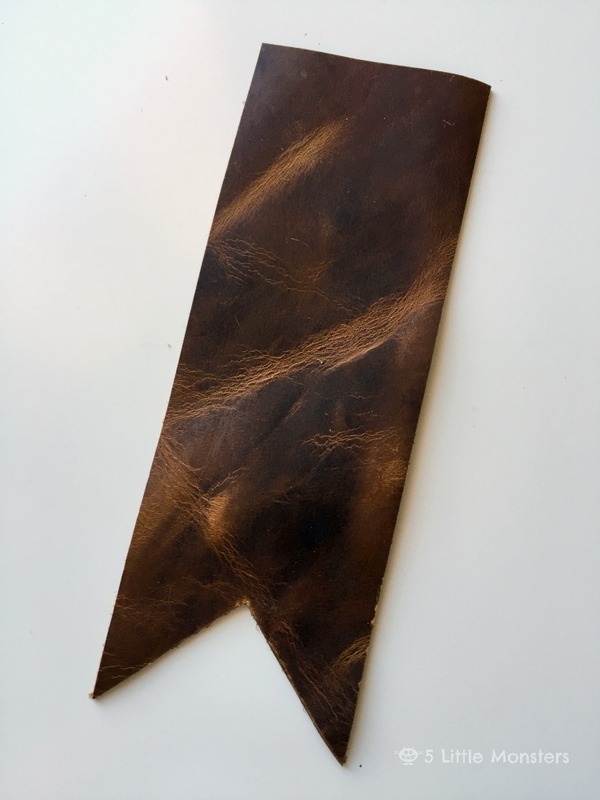 I decided I wanted to do something with leather, but I also wanted to do something simple enough that kids could make it. 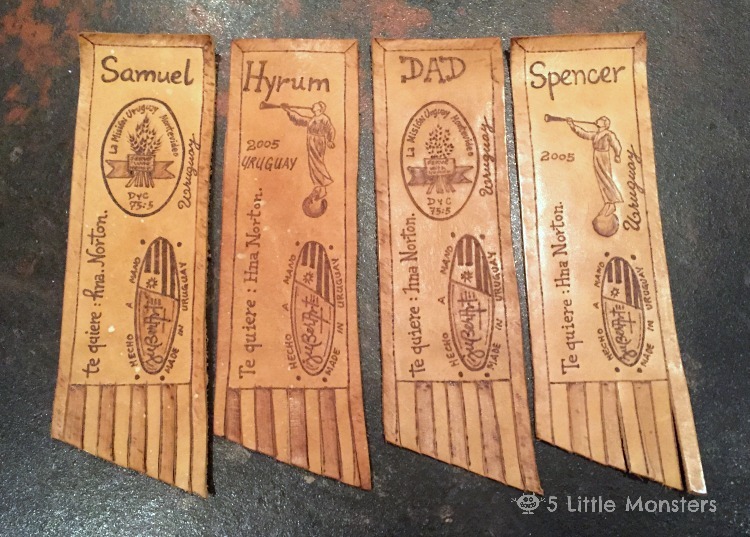 I remembered some leather bookmarks that I brought home with me as a gift for my dad and brothers and thought that leather bookmarks would be a pretty easy project. The ones that I brought home are a lot fancier than what I made but that was my inspiration for this project. 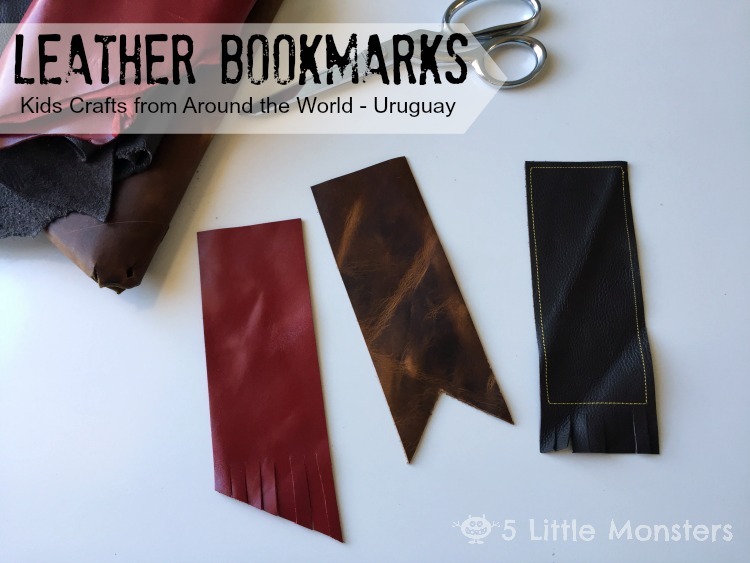 If you have leather stamping tools you could do some stamping to make the bookmarks a little fancier but I really liked the way that they looked just plain. I think that they would be a great gift for kids to make for dad's for Father's Day or birthdays. They look nice enough to be a gift but they really only require a little bit of cutting, and some optional sewing if desired, so basically if a kid is old enough to use a pair of scissors they can make these bookmarks. I got my leather in a 1 lb scrap bag from the craft store. It came with a variety of pieces in different shapes, sizes and colors. I tried to make sure I picked one that had some larger pieces so that I had plenty of space to cut out what I needed. I bought mine at JoAnn, I believe it was around $10 but with a coupon it was cheaper than that. I have also seen them at Hobby Lobby and I'm sure most other craft stores would have something similar. 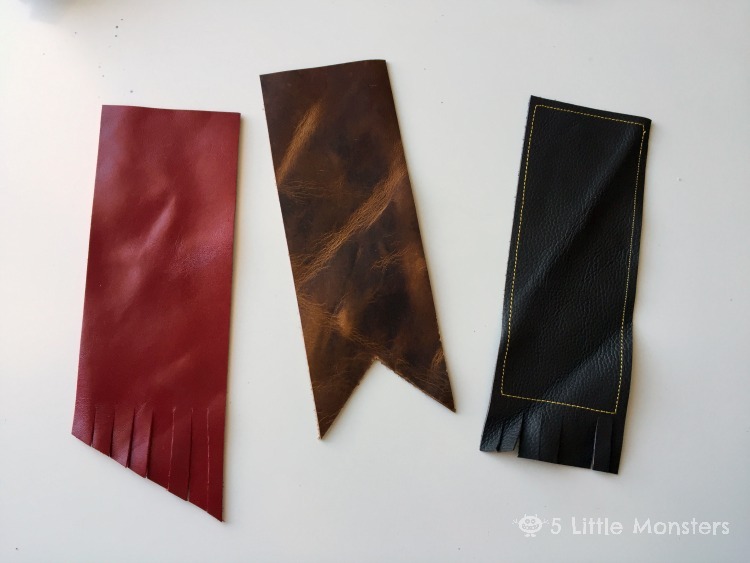 I still have a lot of leather left so you can either make a lot of bookmarks with that or have plenty left over for other little projects. Finished size about 2 1/2" x 7"
Leather scraps that are larger than 2 1/2"x 7"
The first thing you will want to do is make a pattern. 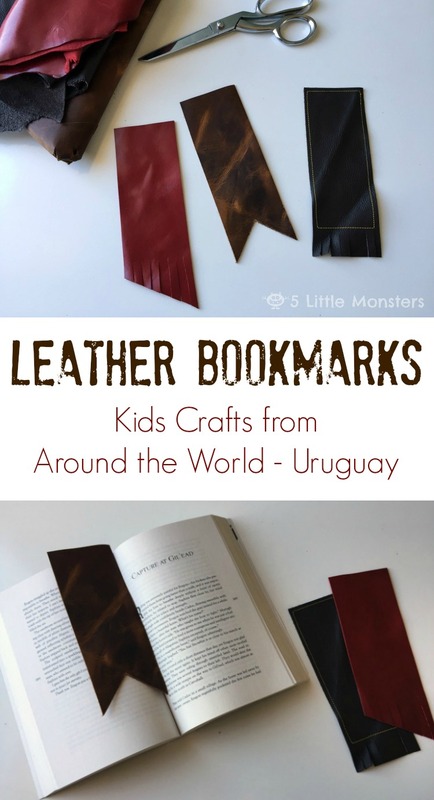 I think that the easiest way for kids to do this is to trace the bookmark on the leather and let them cut it out. If you are not having kids make these then you can skip the pattern and use a rotary cutter and ruler, I just thought that might not be a super safe route to go with kids. For the pattern, make a 2 1/2" x 7" rectangle out of cardstock. 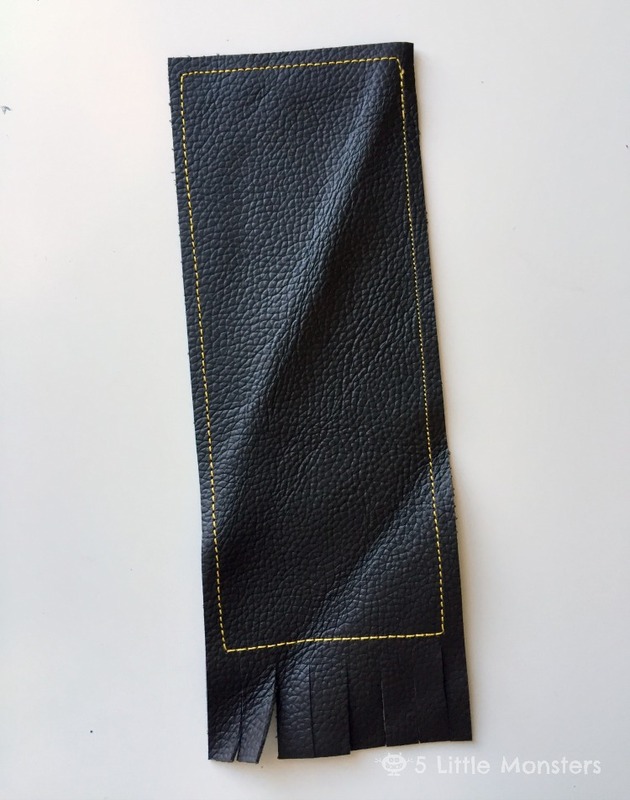 Flip the leather so that the smooth side is down and on the back trace around the rectangle with a pen. Cut the bookmark out along the lines. The first was the red bookmark. For this one I angled the bottom, then I cut a fringe similar to the bookmarks I brought home from Uruguay. To cut the fringe I just drew a line on the back where I wanted the fringe to stop, then cut several small strips to that line. 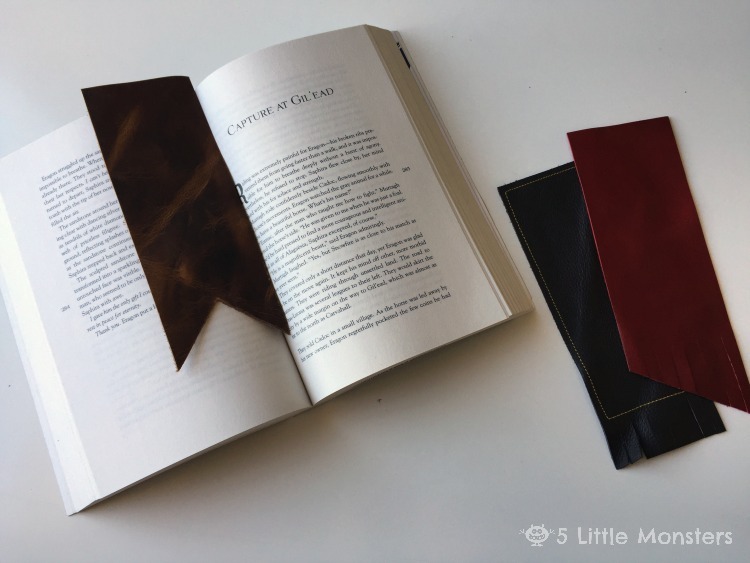 The second was is the lighter brown bookmark. For this one I just cut a v shape into the bottom. I made a dot on the back where I wanted the point to go to, then cut up from each corner. 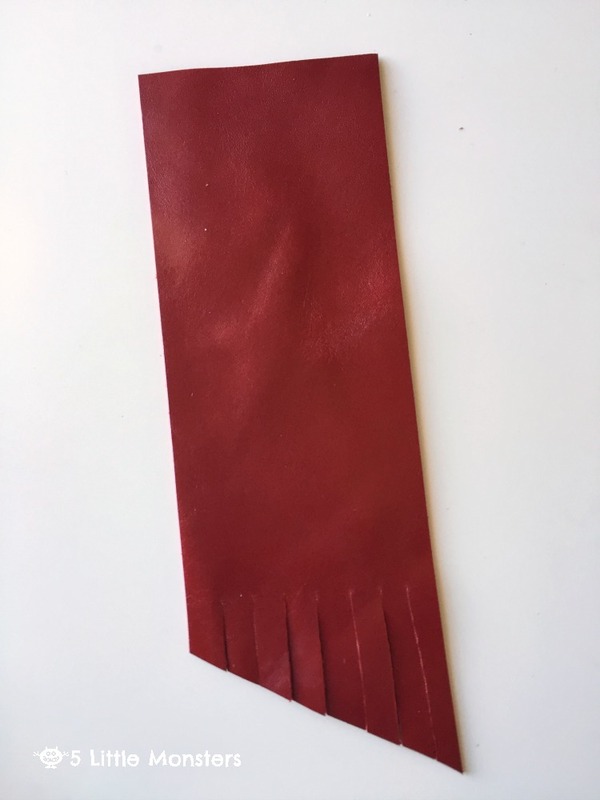 For the dark brown bookmark I cut a fringe the same way as I cut the red one but this time I left the bottom straight. I also decided to add a little extra detail to this one by stitching on my sewing machine around the edge. This is an optional step but I thought it might be nice for some older kids who are learning to use sewing machines. I think my favorite ended up being the lighter brown one. I like the style and the leather that that one was made of. These bookmarks are so easy to make, I kind of feel silly even writing this tutorial, but I think they turned out looking really nice. They would make great gifts for kids to make and give, especially for men who are sometimes hard to make things for. 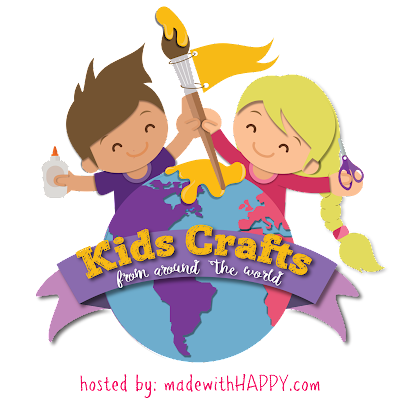 Be sure to go check out all of the other Kids Crafts from Around the World on Made with Happy.